How Does Giving Blood Affect Your Iron Levels? 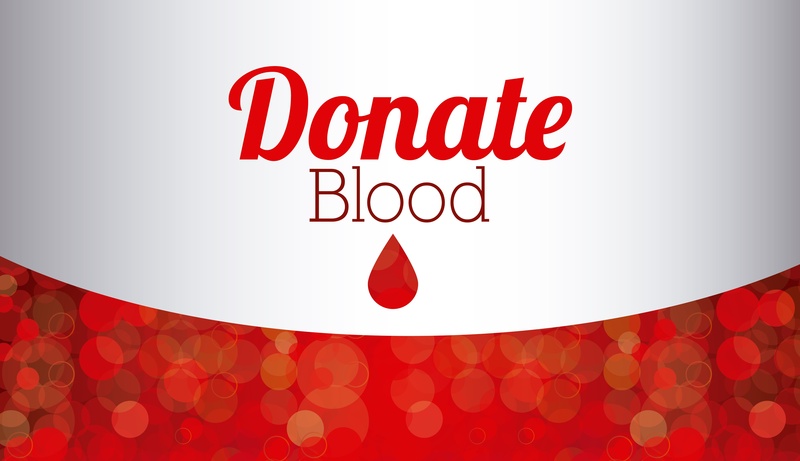 In this blog, InsideTracker Operations Manager Ryan Cohen shares a great example of how to take control of health and human performance by doing something as simple as donating blood to help others. Not only does donating save lives, it sometimes can help with optimizing one’s iron levels as well. My personal experiment in lifting iron, using iron and losing iron. I’m 30 years old. I’ve been lifting weights twice a week for five years. My Red Cross profile says that I’m a gallon donor. An avid Quantified Selfer, I keep tabs on all sorts of data about myself: hours slept, steps walked, pounds lifted, and, of course, the quantities of vitamins, minerals and hormones in my blood. Over the past year, I noticed a troubling trend: my iron levels were rising. For many InsideTracker users, this is usually a good thing. Higher iron levels can mean that your blood is better able to transport oxygen to your cells for intense endurance work, like running or cross-training. Too much iron, on the other hand, is bad news. Chronically elevated iron levels are associated with symptoms like fatigue, joint pain, and can progress to serious organ damage, diabetes, even heart failure. This was a problem I was motivated to solve. A lot of people use up their iron through endurance work, or, in the case of women, lose it through menstruation. I don’t do any regular cardio, and haven’t for years, simply as a matter of personal preference. A year ago, every marker in my iron group was optimized. So what was causing iron to build up in my blood to nearly toxic levels? What had changed? Looking back, I realized that a year ago was around the same time I started working for InsideTracker. Before joining the company, I donated blood to the Red Cross and local hospitals as often as I could - sometimes four or five times a year. 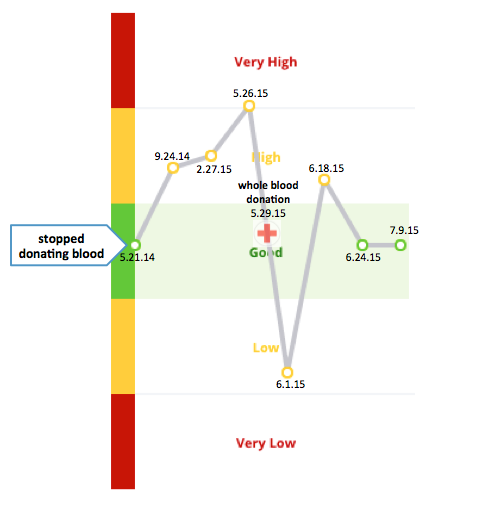 After I came to InsideTracker, I stopped donating blood because I was frequently getting blood draws in order to test new features and new vendors. I didn’t want to lose too much blood too often and suffer from anemia. Had my old habit of blood donations actually been protecting me from excess iron storage? Was the fact that I hadn’t donated blood in over a year the reason my Iron marker now showed up as Very High on my InsideTracker dashboard? I decided to test this hypothesis with a good old-fashioned bloodletting. My N of 1 experiment was simple: I would donate a pint of blood to the Red Cross, check my iron levels a couple days afterwards, and then every two weeks thereafter to see how they responded. Shortly after my blood donation, my hemoglobin and total iron-binding capacity levels dropped significantly, while everything else moved into the optimal zone. Two weeks later, though, every marker in the group was optimized and so far has continued steady on. According to the data, my hypothesis was correct. I did some math and it turns out that I had been much too cautious when I decided to stop donating whole blood. The amount of blood drawn for InsideTracker’s most comprehensive panel is tiny, less than 8% of the volume given in a single whole blood donation. I would have had to do 47+ InsideTracker tests in the past year to lose the same amount of blood as I regularly gave when I was donating! Not only did this mean that I was forfeiting an opportunity to help people in need, but it was also negatively affecting my health. I now intend to regularly monitor my iron levels and donate blood when they start to exceed the optimal range. A quick plug for the Red Cross: giving a pint of whole blood takes less than an hour and can save up to 3 lives. There is no artificial substitute, so blood donation is a critical part of our health care infrastructure. Plus, it’s very easy to find your nearest blood drive. In summation: If you have elevated iron levels, donating blood is a great way to optimize your biomarkers and help save lives. What can your blood tell you about yourself? Take a deep dive into your biochemistry.